As the cold invades the city, a swarm of flowers sprinkles on ELIE SAAB Ready-to-Wear Fall / Winter 2018-2019 collection, as if to compose a winter bouquet and infuse a dark romantic touch to the collection. Dominated by black, highlighted by touches of white, powdery pink, blue and intense burgundy notes, the collection features an array of embroidery, appliqués and floral prints. Like a floral composition born under the brushes of an impressionist painter, the flowers are drawn between draperies and pleated fabrics, under thin layers of black tulle and delicate lace, and sometimes even in all-over prints on the jackets , pants and dresses. Bouquets bloom at the waist and extend to the hems of coats and evening dresses. 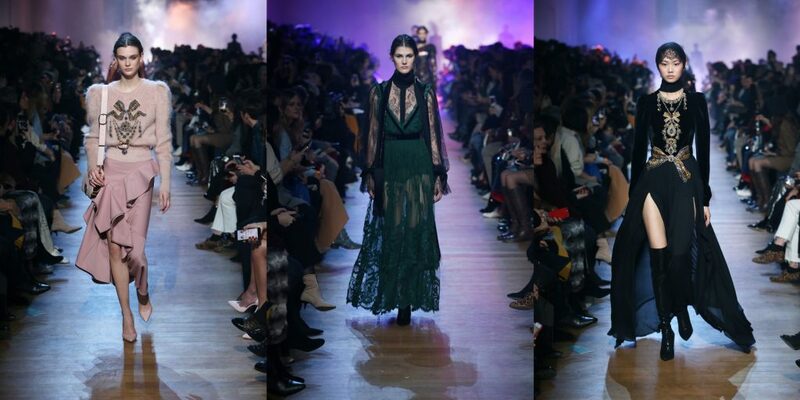 ELIE SAAB takes this ode even further with subtle laser-cut tone-on-tone velvet patches and crests that adorn leather jackets, skirts and mohair sweaters.